I rarely throw out old cookbooks. On the contrary, the older and more worn they are, the better. But recently, I had to toss out a cookbook that I found at a garage sale only because it had completely fallen apart at the seams. It was from 1964 and simply called “Delicious Asian Recipes.” This tattered little book served its purpose, though. Out of it came two of my favorite dressings. Both go splendidly with a refreshing and healthy chicken salad that is perfect for spring and summer! Heat oil in a deep skillet. Stack wonton wraps and slice in ¼" strips. When oil reaches 350ºF, add wonton strips and fry, stirring gently with a fork or tongs for about 30 seconds or until golden-brown (strips will brown quickly). Gently remove with a slotted spoon or tongs, and drain on a paper towel. Place a dry skillet on medium high heat. Add sesame seeds and toast, shaking the pan back and forth until they are golden to medium-brown in color. Pour them into a bowl. Return the pan to heat and add slivered almonds (if using in place of cashews). Toast the slivered almonds, stirring constantly, until they are golden-brown (about 3-4 minutes). Place in a bowl and set aside. Make the dressing of your choice and refrigerate until ready to serve. 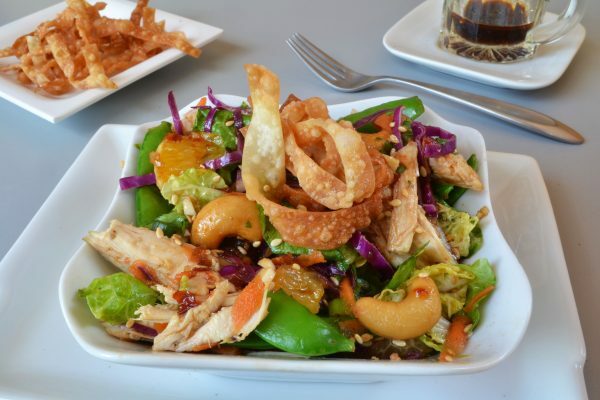 In a large bowl, combine the sesame seeds, almonds or cashews, chicken, Napa cabbage, red cabbage, snap peas, green onions, carrot, orange pieces, and dried cranberries. Pour the dressing over the mixture and toss to combine. Add some salt and pepper to taste. Serve chilled. Combine ingredients and whisk together until thickened.